Tiny leaves on a vine repeating in this handmade 1"x6" tile. It is a simple but pretty design that will add visual interest to any tile installation. For a more subtle look, choose a lighter, low contrast glaze like white or celadon. For more drama, select a deeper colored glaze like leaf green or watercolor blue. Price listed if for a single tile; grouping is shown for reference only. 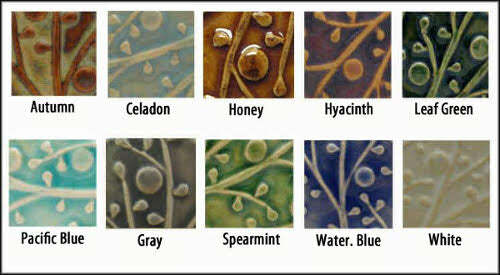 Whatever glaze you choose, know that it is lead free and dinnerware safe because Emu Tile uses only non-toxic glazes. This particular tile does NOT come with a hanging slot for temporary installation; it is primarily intended for permanent installation. It is deal for a kitchen, bathroom, or fireplace surround. The "leaves" handmade tile is an original design, sculpted in relief and reproduced by the artist, by hand. Approximately one half inch thick, except where the raised pattern is. The relief design makes it slightly thicker in those areas. Made of durable stoneware which is fired twice, first to 1800F, then again to 2200F.